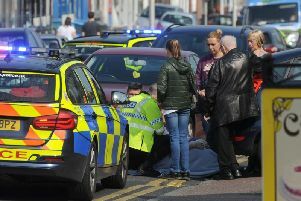 A 70-year-old man was involved in a collision with a car in Kincraig Road, Bispham, this afternoon, police said. Witnesses said he suffered head injuries, which were understood to be serious. A spokesman for Lancashire Police said the man was in a collision with a black Honda, which was pictured with damage to its windscreen and bonnet, at around 12.45pm. The driver stayed at the scene and was helping officers with their enquiries, he added. Two air ambulance helicopters were called to the scene, a spokeswoman for the North West Air Ambulance charity said, and were seen landing nearby. The road was closed between Beattock Place and Galloway Crescent while an investigation was launched. The force's drone team was deployed to take aerial photos, which a spokesman described as "vital photographic evidence". Buses on the number three route were diverted via Ashfield Road in both directions, Blackpool Transport said. The road was re-opened by 4pm. Nobody at the North West Ambulance Service could be reached for a comment. Witnesses were asked to call police on 101, quoting reference 0654 of today's date.